Arranged by Amy Hite. Folk. Individual Part. 27 pages. Published by Amy Hite (S0.260837). This is a collection of thirty folk songs originating from many different parts of the world. 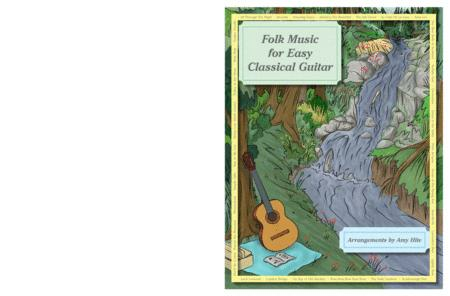 They are arranged for easy classical guitar. Most of the music is in first position, with a few songs exploring higher positions. The level is appropriate for beginner-intermediate guitarists. The arrangements are colorful and fun to play. Contents: All Through the Night, Alouette, Amazing Grace, America the Beautiful, The Ash Grove, Au Clair de la Lune, Aura Lee, The Blue Bells of Scotland, Buffalo Gals, Clementine, Down in the Valley, Frére Jacques (Are You Sleeping? ), House of the Rising Sun, Kum-Ba-Ya, Lavender's Blue, Lightly Row, Loch Lomond, London Bridge, On Top of Old Smokey, Row, Row, Row Your Boat, The Sally Gardens, Scarborough Fair, She'll be Comin' 'Round the Mountain, Shenandoah, Simple Gifts, Skip to My Lou, Swing Low, Sweet Chariot, Turkey in the Straw, Waly Waly (The Water is Wide), Yankee Doodle. those) as well as those who have been playing longer - in my opinion there's always a challenge to be accepted and satisfaction to be gained from playing any song, no matter what technical level it's aimed at. Overall, I'm delighted with this and the author is to be thanked for sharing her arrangements with us!